As the Trump administration charges forward with its war on science by canceling a “crucial” carbon monitoring system at NASA, scientists and climate experts are sounding alarms over atmospheric concentrations of carbon dioxide (CO2) that just surpassed a “troubling” threshold for the first time in human history. 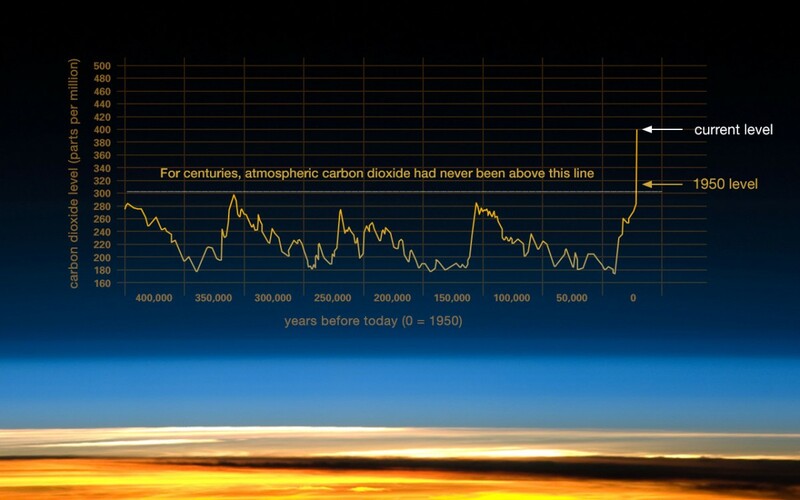 While the planet’s concentrations of carbon dioxide fluctuated between roughly 200 ppm and 280 ppm for hundreds of thousands of centuries, as the NASA chart below details, CO2 concentrations have soared since the start industrial revolution—and, without urgent global efforts to significantly alter human activities that produce greenhouse gas emissions, show no sign of letting up. “As a scientist, what concerns me the most is not that we have passed yet another round-number threshold but what this continued rise actually means: that we are continuing full speed ahead with an unprecedented experiment with our planet, the only home we have,” Katharine Hayhoe, a climate scientist at Texas Tech University, told Mooney. In the mid-Pliocene warm period more than 3 million years ago, they were also around 400 parts per million—but Earth’s sea level is known to have been 66 feet or more higher, and the planet was still warmer than now. As a recent federal climate science report (coauthored by Hayhoe) noted, the 400 parts per million carbon dioxide level in the Pliocene “was sustained over long periods of time, whereas today the global CO2 concentration is increasing rapidly.” In other words, Earth’s movement toward Pliocene-like conditions may play out in the decades and centuries ahead of us. As climate scientists continue to warn about the global consequences of rising levels of CO2 and other greenhouse gases—such as more intense and frequent extreme weather events—the Trump administration has pursued a multi-pronged anti-science agenda that includes rolling back regulations that aim to limit emissions and blocking future research. Canceling CMS likely has global ramifications, Kelly Sims Gallagher, director of Tufts University’s Center for International Environment and Resource Policy, pointed out, because the system monitors the Earth’s CO2 levels as nations that have signed on to the Paris climate agreement—from which Trump plans to withdraw—pursue policies to reduce greenhouse gas emissions.